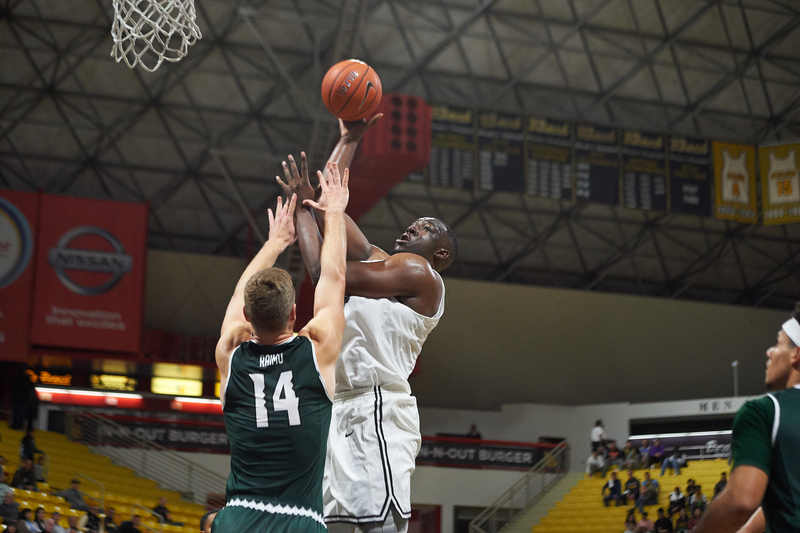 Long Beach State lost their sixth game in a row Thursday night at Walter Pavilion 77-70 to Big West conference foe Hawaii. The loss was their second this season to the Rainbow Warriors, giving them the season sweep. Long Beach State sits at 2-6 in Big West play now, good for second to last in their conference. After facing a six-point halftime deficit, Long Beach State opened the second half on a 9-0 run. The crowd was energized and momentum had shifted. However, the lead would not last for long. Hawaii retook the lead 47-46 minutes later and pushed it to 61-53 a few minutes after that. The 49ers were never able to get back over the hump and faced the harsh reality of another close loss. Senior forward Mason Riggins was out of this game with flu-like symptoms. This cleared the way for Temidayo Yussuf to return to the line-up, and he did not disappoint. The senior big man scored 18 points as well as grabbing six rebounds. Deishuan Booker had a quiet night for his standards, scoring just 11 points. The senior guard coupled that with four assists and four turnovers as well. Edon Maxhuni led all bench scorers with 10 points with Jordan Roberts contributing nine of his own. Despite shooting five percent better from the field and out-rebounding the Warriors 42-33, turnovers proved costly. 16 49er turnovers turned into 22 points for Hawaii. They would also shoot a blistering 14-27 from three-point land, good for 52 percent. Senior guard Brocke Stepeau led all scorers with 23 points. Senior forward Jack Purchase also had 17 points, while guard Drew Buggs had seven assists. Long Beach State will start a three-game road trip Saturday at Cal Poly. With only eight regular-season games left on the schedule for the 49ers, winning has become paramount. They will look to turn things around and snap their season-long six-game losing streak.